Liver damage from cirrhosis cannot be reversed, but treatment can stop or delay further progression and reduce complications. Treatment depends on the cause of cirrhosis and any complications a person is experiencing. Regardless of the cause of cirrhosis, it is essential that every patient avoid all substances, habits and drugs that may further damage the liver or cause complications or liver failure. Alcohol, in addition to causing cirrhosis, may accelerate the progression of liver scarring. All patients with liver disease should not drink any alcohol. Medications also may be given to control the symptoms of cirrhosis. Q. Who Needs a Liver Transplant ? 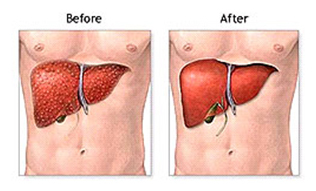 Medical treatment for liver diseases and liver damage is always the first choice of therapy. The only reason to perform a liver transplant is that all other forms of treatment have been unsuccessful, and the patient's liver can no longer support life. This is called end stage liver disease. Pre transplant tests are done to evaluate the severity of the liver disease. Once this initial evaluation is complete, the case is presented to a review committee of physicians and other staff members of the hospital. CT scan of the abdomen : - This is a computerized picture of the liver that allows the doctor to determine the liver size and to identify any abnormalities, including liver tumors, which may interfere with the success of a liver transplantation. Ultrasound of the liver : -This is a study that uses sound waves to create a picture of the liver and the surrounding organs. It also determines how well the blood vessels that carry blood to and from the liver are working. ECG : -Short for electrocardiogram, this is a study that shows the electrical activity of the heart. Blood tests : -These include blood type, blood cell count, blood chemistries, and viral studies. Dental clearance : - A person's regular dentist may fill out the form. Immunosuppressive medications may affect the teeth; therefore, a dental evaluation is important before beginning these medicines. Gynecological clearance : - The patient's gynecologist may provide clearance. 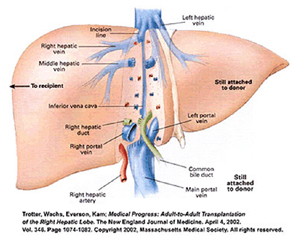 Unfortunately, the body cannot determine that the newly transplanted liver serves a helpful purpose. It simply recognizes it as something foreign and tries to destroy it. In rejection, the body's immune system attempts to destroy the newly transplanted liver. Without the intervention of immunosuppressive drugs, the patient's body would reject the newly transplanted liver. Immediate, or acute, rejection occurs just after surgery, when the body immediately recognizes the liver as foreign and attempts to destroy it. Acute Liver rejection occurs in about 2% patients. Delayed, or chronic rejection can occur years after surgery, when the body attacks the new liver over time and gradually reduces its function. This occurs in 2-5% of patients. Home care involves building up endurance to carry out daily life activities and recovering to the level of health that the patient had before surgery. This can be a long, slow process that includes simple activities. Walking may require assistance at first. Coughing and deep breathing are very important to help the lungs stay healthy and to prevent pneumonia. Diet may at first consist of ice chips, then clear liquids, and, finally, solids. It is important to eat well-balanced meals with all food groups. After about 3-6 months, a person may return to work if he or she feels ready and it is approved by the primary doctor. Exercise : It is important to have daily exercise routine to build up your muscles weakened by illness. The Transplant Team will give you extensive information on living with a new liver and We Care in association with the Liver Transplant team will be always available for any communication after the transplant. 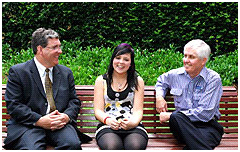 Liver donation is possible from a living donor who is a relative of the recipient who can donate half his/her liver. 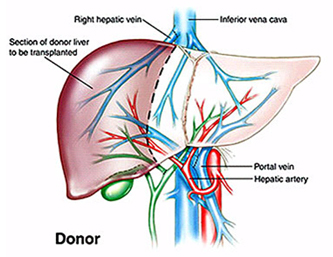 The donor operation is entirely safe and the half liver quickly regenerates in both the donor and the recipient in a few weeks. In the first few days after operation even when regeneration is not complete, the half liver is enough to maintain normal donor functions due to the immense reserve in the liver. The suitability in the above respects and some other technical points is determined by the Transplant Team in Pre-transplant donor evaluation which normally takes 2-3 days. A number of tests, including blood and urine, will be required to verify that a potential donor is entirely healthy and does not show evidence of liver disease or other conditions that may prevent such a donation. A liver specialist, not involved in the care of the patient, is consulted to assess the health and suitability of the potential donor. As with patients undergoing evaluation for a liver transplant, potential donors will be interviewed by a social worker and a psychiatrist. Any medical, social or psychological issues identified may preclude an individual from donating. A liver transplant is recommended for children who have serious liver dysfunction and will not be able to live without having the liver replaced. 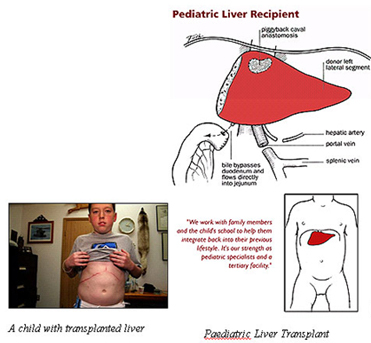 The most common liver disease in children for which transplants are done is biliary atresia. Other diseases may include Alagille syndrome, alpha-1-antitrypsin deficiency, Wilson's disease, hepatitis, and hemochromatosis.